But these drinkables are by no means new innovations. Throughout history, several prominent cultures have harnessed cannabis’ healing power through teas. In many Jamaican and East Indian households a common home remedy for morning sickness and pregnancy-related stress is is often a cup of cannabis-infused tea. Intrigued? Keep reading! Otherwise, if you’re a regular or semi-regular user, a standard starting dose is one cup (250 ml) every 24-hours. If you find that the medicinal effect isn’t quite enough for your situation, you can increase to two cups (500 ml) every 24-hours, taken at 12-hour intervals (once in the morning, once before bed). Want to make your own marijuana tea? The easiest way to brew a cup is to simmer the marijuana buds, leaves or stems for 30 minutes with an added fat (like butter or coconut oil), depending on the medicinal strength you want. Marijuana-infused teas made from cannabis buds produce the strongest effect; teas made from leaves are milder; and stem-made teas have the weakest effect of all three. Here are three different marijuana tea recipes utilizing each of these plant parts that you can easily make at home! Optional: Milk, sugar or honey to taste. Grind the buds. Remove any stems and put them aside to make a separate cup of stem-infused tea. Place the ground buds into a bowl and add the butter, mixing carefully; the back of a spoon works very well for this. Try to get every piece coated with a little butter. Carefully add the water to a stovetop pot on medium heat, slowly bringing it to a simmer, then gently spoon in the marijuana butter mixture (be sure to scrape the sides of the bowl). Keep the water simmering and “brew” your tea for 30 minutes, stirring often. Remove your pot from the stove and allow to rest for a moment, or until the bubbles to stop breaking the surface; once cooler slowly pour it through a strainer and voila—tea! If you find the taste too strong, you can always add a tea bag of your choosing to the pot during the last 3-5 minutes of brewing. To make a mild-tasting tea with even lesser “intoxicating” effects, simmer 1-2 grams of stems, leaves, or a combination of both in 1.5 cups of water for 30 minutes. Strain and drink! That’s it! It’s a perfect drink before bedtime. If you’re not feeling up to the challenge of making your own cup of marijuana tea, you can always enjoy these pre-packaged ready-made teas anytime, hot or cold! Sarah’s Medicated Teas, based in Colorado Springs, CO, are available for purchase online. They’re currently branching out into Northern California and will soon be available at Dank Valley Farm, Indigo, Humble Root, and From the Earth. The Venice Cookie Co. offers four different flavors of their “Subtle Tea”: PM, a non-caffeinated chamomile, spearmint and valerian combo, Chai, Green, and Black (Ceylon). Each bag contains 40mg of THC. Have a discerning palate? House of Jane offers “Jane’s Brew Gourmet Cannabis-Infused Teas,” available in both C-Cups (for Keurig style machines) and traditional bags available in three doses: 20mg, 80mg or 200mg THC. 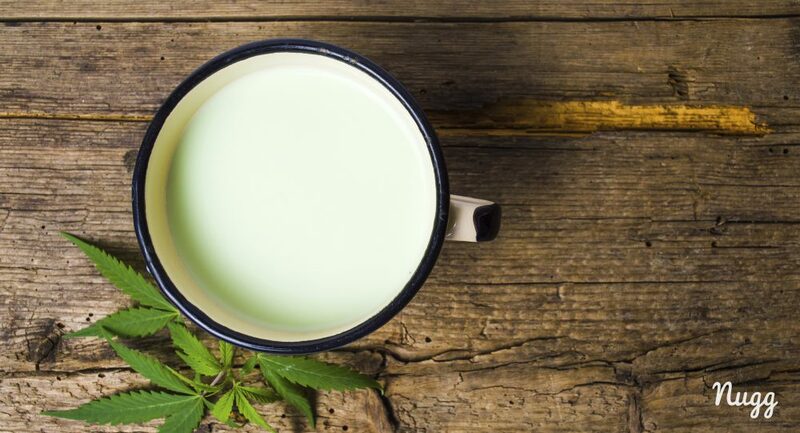 You can also find cannabis-infused tea by searching for the keyword “tea” on Nugg, which will search the inventories of nearby cannabis dispensaries and let you order delivery online if any are available! “I prefer teas to smoking because I don’t feel sluggish, just relaxed and alert.” —Ember Rose of Denver, CO. Thanks, there are some really great CBD teas at https://cbdinfusedtea.com as well in case you want to check them out. I’ve been making pot tea for years made from growers bunk. This bunk has raisin size buds perfect for making tea. I reach in the bag and grab a mitt full in a big cooking pot. I add a shot of virgin oil for that extra kick then steep it for 24 hours. It takes many different body stones to get the right strength that your seeking. Remember the strain of the pot from bunk can very to high test to sleep mode. A body stone can be quite entertaining. I freestyle with my tea, using about 3 Tbs ‘chipped-up’ buds with a couple leaves mixed-in. About 1.5 cups water, boiling add 1 Tbs butter and 1 Tbs coconut oil, then add buds. Reduce heat and simmer approx 15-20 mins. Leave to steep about 15 mins. Strain off about 1/4 cup liquid, pressing out some of the buttery oil. To this I add whatever I feel to flavor tea with… coffee, chocolate, both for a mocha flavor, cinnamon, rose water, etc. The variations are endless. And now that Christmas is here, top that with gingerbread marshmallows for a decadent hot cup of goodness! Those mellows just soak up the butter, yum! Oh, and the best part… I can re-brew these buds every day for less time, adding a bit more butter/coconut oil each day, for another 5 or 6 days! It becomes less strong to the last days, but it’s still a great and effective drink. I refrigerate the tea daily after it cools. I had that marijuana are the best wen comes to heal stomach cramps or bugs. I allway have a tree in my garden for smoke, I boiled a bud, I even forgot abt the stomach arch. Thanks for sharing about marijuana tea benefits, effects, recipe and dosages, this will really helpful for patients who wants to know about marijuana benefits for pain relief, improve appetite, treatment of cancer and reduced stress. For my pain I also used alternate healing from cbdoilempire[dot]com, offers the best selection of the top CBD Oil, hemp derived CBD products all in one place. It’s really interested and may be healthily for my daily morning with cup of tea. I feel awesome now for that. i will must share to my friend that. I will revert to here if any fell some quotation about this. I am an Apprentice Herbalist and here is how I make Cannabis tea (infusion). I decarboxylate all my stems and leaves at 220 F. for about 60 min. I steep this material in hot water for 10 min then enjoy. It is quite a powerful sedative, antiemetic, hypnotic. Would be good for chronic pain, insomnia or for acute conditions of stress. I took this for extreme morning sickness but would not recommend for pregnant women for a prolonged time. Love to read your blog! Many thanks for sharing the health benefits of marijuana tea. I’m sure people would find very useful info from this blog. Cannabis infused tea is very good for our bodies. It has antioxidants to get rid of free radicals! Great post! Great cannabis recipe! I love cannabis tea! Your bud tea recipe is superb! Excellent article! I just love drinking tea! It’s nice to know this information!